We have a saying in Germany that goes like this: “Warum in die Ferne schweifen, wenn das Gute liegt so nah.” And this is exactly how I feel today: why looking for things far away when the good stuff is so close. After some preparations last weekend this Saturday welcomed me with some excellent spring weather: sun, 18-20 degrees. Just exactly the right weather to bring some spring to my balcony too. I had bought some flowers already last week and when I went shopping this morning I bought some more. And after a hearty breakfast I went outside, just wearing pants and a t-shirt (what a great feeling to be with bare arms and feet again), and started planting. Unfortunately some stuff on my balcony didn’t make it through the winter but now it looks quite planty again and honestly, there’s nothing better than having a cigarette, sitting on my garden box, looking at my balcony (ok, not smoking would be healthier, but hey, stopping to smoke is on my list for next year…). So, where ever you are, I hope the weather is nice too this weekend and you just enjoy the time where you are! 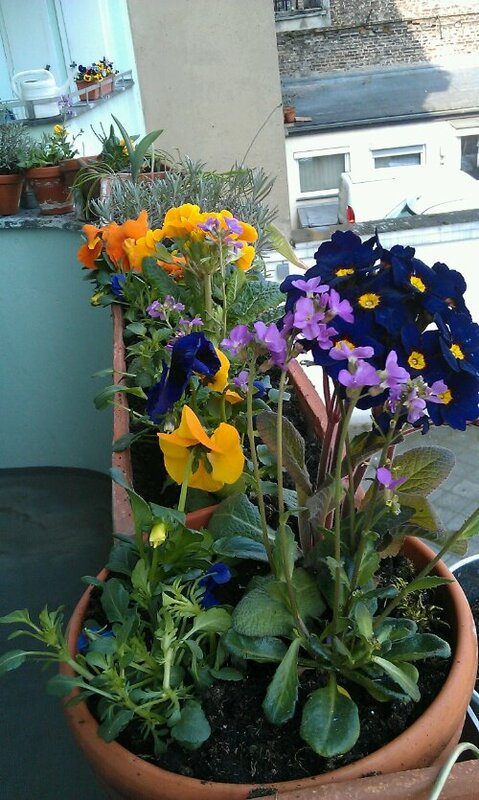 This entry was posted in Gardening and tagged Balcony by kathatravelling. Bookmark the permalink.